Dr Jengo's World: Plants vs Zombies 2 Charity Event! 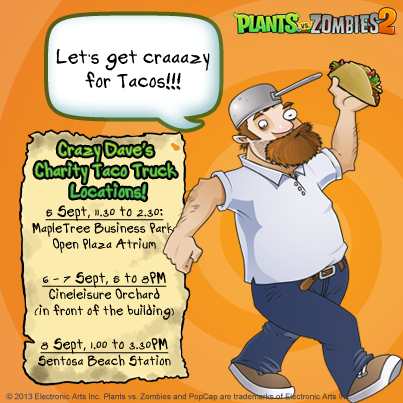 Was at Orchard Road near Cineleisure earlier today when we spotted the Crazy Dave's Charity Taco Truck! EA Singapore was having a charity event where you could get free tacos and you can pay whatever you want, which will all go to the charity organization, Club Rainbow. All for a good cause! If you missed it, don't worry. There are still couple more appearances over the weekend. Go down, grab a taco and do your bit for charity. We did ours!